Hannah running around the resort grounds. She was so happy to not be on the airplane anymore! Everything on this trip was just amazing to Hannah! We must have heard "whoa" or "wow" all day long! Here she is watching the rollercoaster take off. Hannah fell right into the celebrity life in California. Here, she is greeting her fans by blowing kisses to those who pass by. Hannah loved watching the parades this time! 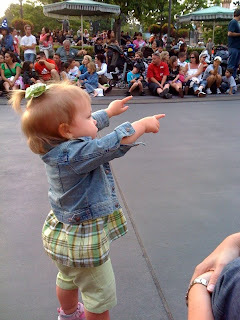 She would stand up as soon as the music came on and would start dancing and clapping. "Mom, please no more pictures!" Hannah has learned sign language for more. Many times on this trip, as we were coming off a ride, she would sign "more, please." She loved the rides this time. We rode "it's a small world" about six times in the three days we were there! Hannah has decided that she really likes Winnie the Pooh during this trip! 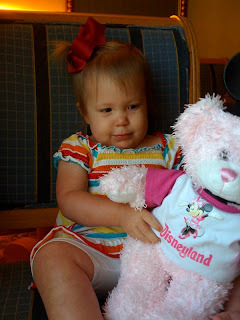 Hannah waved to Minnie during one of the parades and Minne ran over to see her! On the last day of our trip, we headed to our hotel to wait for the bus, and ran into Goofy! He sat next to Hannah and played for about ten minutes. 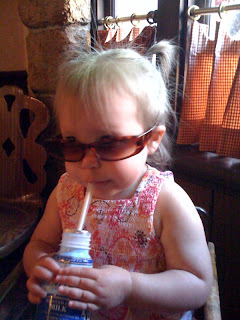 Our "cool cat" drinking her milk in Disneyland. She's having a blast. so much fun today...especially at the parade. calling her. We're having a blast in Disneyland! Now that Chet has an iPhone, he doesn't really need his iPod anymore. I started doing some research on toddler headphones so Hannah could watch Veggie Tales and Mickey Mouse on our many trips. I found this awesome case and headphones this week. As you can see, Hannah loves it! She thought it was so funny to see Bob and Larry on the little screen. Three hour plane ride here we come! We found this Cinderella dress on one of our recent Disney vacations. It was on the clearance rack, so we got an incredible deal! We tried it on because we are heading to Disneyland (California) next week! We decided yesterday to take advantage of their incredible travel agent discount. Chet and I are looking forward to a little down time before our crazy summer starts! We are so excited to go with Hannah this time. She is so much fun to be around right now. 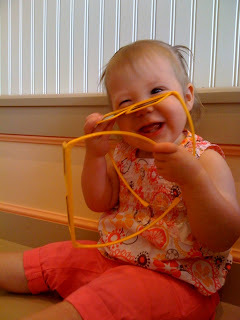 We love spending time with her and experiencing everything through her eyes. This is what it is all about! ...and Hannah's prince is, of course, her Daddy. We took advantage of the sunny weather this afternoon and headed to the park! Hannah loves being outside so she had a blast! Today was the first time that she has gone down a 'big' slide (more than two feet long). She loved it and didn't want me to hold her anymore after the first time down. We may have a little daredevil on our hands! Today I made a couple of icebox pies, however, on the way to put them in the freezer, one ended up all over the floor. Hannah ran in to see what was going on. Rather than trying to keep her out of it while I cleaned it up, I stripped her down and sat her in the middle of the splattered mess. As you can see, she enjoyed her snack of strawberry yogurt and graham crackers! ...and have some fun girl time! But we are ready for him to be home!